Finding the perfect diaper isn’t easy. As a new mom you will try so many brands and you may even do research on diapers that are organic or chemical free. 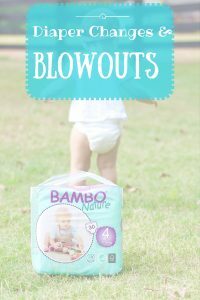 I have a girlfriend that raves about Bambo Nature diapers, but for some reason I just stuck with what I had been using and never gave them a try. Finally I tried them and guys.. I’m in love! 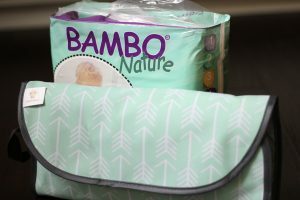 Bambo Nature brings you a premium baby diaper that’s gentle, extremely soft, and made of a high percentage of sustainable materials. I’m not joking about the soft part. It was the first comment to my husband as I opened the pack. 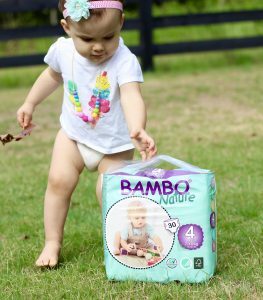 Did you know Bambo Nature has earned more credentials, awards, and eco-labels than any other diaper on the market? I didn’t know this, but after trying them I know why. Izzy loves blueberries, but they make her poop more runny and black. Runny poops can leak and the black color can stain. 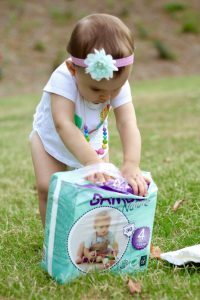 This is why I’m loving the Bambo diapers! Seriously no leaks, which saves me time in the laundry room! I wish I had them when Izzy was an infant and all of her poop was like liquid. Enough poop talk, I wanted to also share a fun invention called the SnoofyBee. 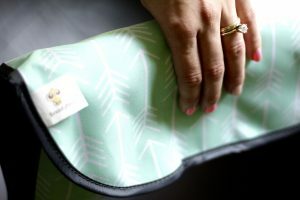 This is a changing pad that rolls up easy for on the go. You can use it at home or out and about. Why is it great? If you have a wiggly baby then you can clip toys onto the pad so they play while being changed. I also like that their is a velcro adjustable cone wrapped around their waist to keep their hands form going into their poop! I had Izzy explore the SnoofyBee with her baby doll before giving it a try. The SnoofyBee is nicely padded and easy and to wipe off if any mess gets on it. If you are interested in learning more about SnoofyBee you can get yours here. I received the mentioned items in this post in exchange for an honest review. As always all thoughts and opinions are 100% my own. I’m always looking for natural products to use with my kids so I’m especially loving this post. Thanks for sharing! So glad I could share a new diaper brand with you! Diapers that don’t leak?! Seriously might be a miracle. I’m actually very intrigued! I have never heard of these but I need to check them out! I really want to switch to a more environmentally friendly diaper! I’m pretty much sold on anything that holds up to black leaky blueberry poops ??? Gotta have those diaper essentials! for real THE BEST diapers! Cute pictures too!!! I’ve heard such great things about these diapers! Oh I’ve heard of these! In fact I think I have a sample one that I clearly need to try! Yes you do! I’m pretty obsessed now! Love these diapers! My favorites before trying these were Honest diapers. I am very impressed!